Whole Foods is not my first choice for grocery shopping. It’s not even my last choice but if you’re anything like me, perusing the aisles (even if I don’t buy anything) is one of my favorite pasttimes. I always make it a point to check out the fresh pastries at Whole Foods Del Mar. I spotted on the bottom shelf a tray of croissant doughnuts. It was toward the end of the evening and only four were left; it didn’t look like a good (or fresh) sampling. I was determined to return and see if they still had them available. And several days later, they did. 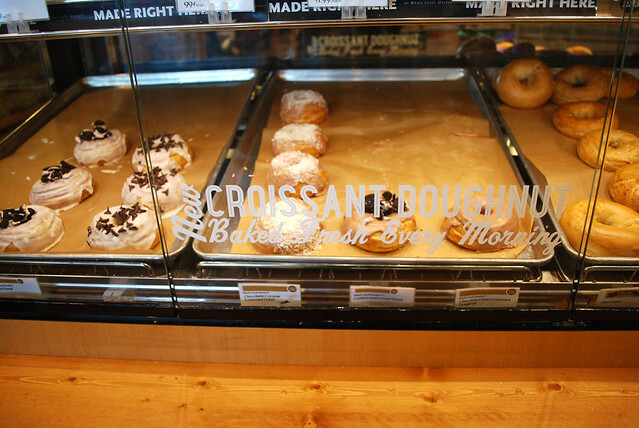 They had five varieties: croissant doughnuts topped with plain or chocolate icing and a variety of toppings, all at $1.99 each. There were chocolate glazed with sweetened coconut flakes, white glaze with chocolate shavings and a few topped with peppermint sandwich cookies. I didn’t want to go hog wild and settled on the plain icing with sandwich cookies and chocolate icing with coconut. Depending on which pastry you chose, they stand nearly two inches tall. As for taste, I wasn’t too impressed. Whereas I found the glazed croissants at K Sandwiches a bit on the oily side, these were dry. I suspect that someone took croissant dough, punched out a doughnut shape, baked it and topped it with whatever toppings they had on hand. My favorite toppings were the ones topped with crushed cookies. It doesn’t have much of a departure from other croissants except for the shape and topping. These pastries must be popular, seeing as how so few of them remain at the end of the day. 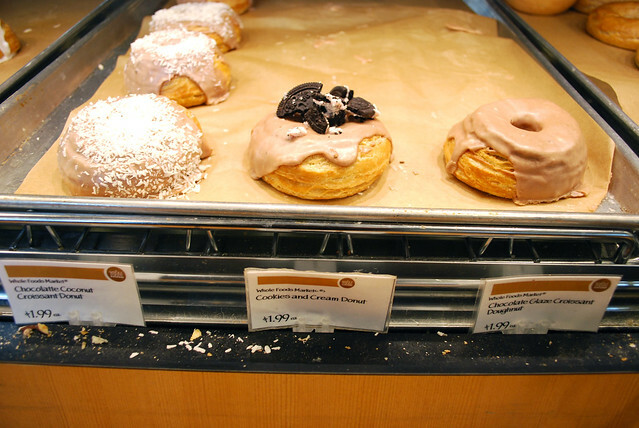 The croissant doughnuts were found at Whole Foods Del Mar. I’m unaware of other stores making them so it’s best to call ahead. Related: San Diego’s Cronut Contender: Azucar’s Cray-Nut, Paris Baguette’s Croissant Donut, Peterson’s Cronut and K Sandwiches’ Glazed Croissants. I didn’t know Whole Foods Del Mar had these things?!! I love love love the Whole Foods in Del mar. Sad that the croissant doughnuts weren’t as great but it’s cool to see the toppings they had on ’em. The Whole Foods in Del Mar is so nice. It might be the nicest one in the county with Encinitas a close second. Each Whole Foods seems to have it’s own special little offerings. I love cruising around in Whole Foods, too, even though I balk at the prices. I always want to buy all the chocolate and everything in the bakery case. They look pretty, but that’s too bad they weren’t super duper awesome. I like seeing the variation of toppings/icing flavors though. re: Prices. I agree. Once I bought three things on a whim and it added up almost $20. Yikes. I haven’t been to a Whole Foods in years. I used to like going to the one in Hillcrest, mainly to look around. If anything, I would buy some chocolate but that was about it. Too bad the fake cronuts weren’t as good as they could have been. Parking at Hillcrest Whole Foods can be insane but I manage to go when it’s not hectic. You are so good at spotting new contenders in SD for croissant doughnuts! These look so pretty, it’s a shame they didn’t taste very good. Haha! I think I just like peering into pastry shelves. You never know what you find! 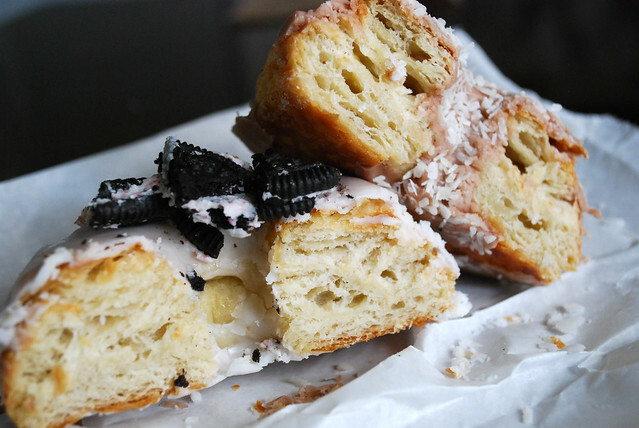 So, I have yet to eat an outstanding croissant doughnut. 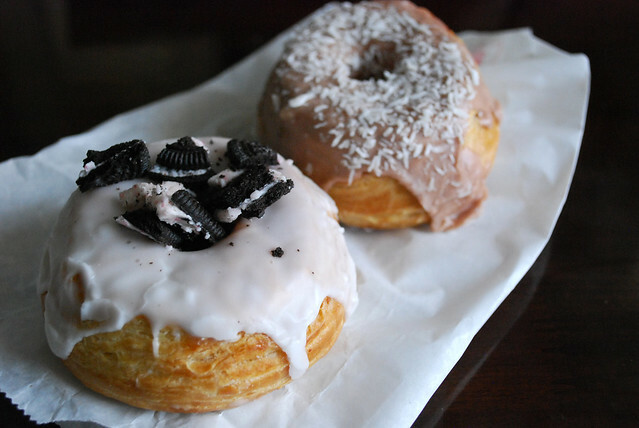 I’ve only tried the ones at Donut Bar, and they are good, but not great. I need to make it over to Donut Bar. I still haven’t tried it and I’ve heard the same comments about their Crobars.